Cassie, a 13-year-old girl is searching the universe for her father after he was kidnapped by space pirates. 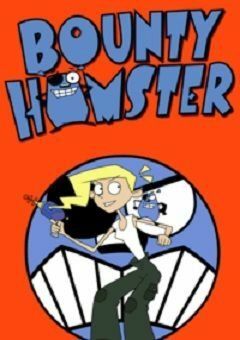 To help her, she enlists the aid of the only bounty hunter she can afford, a talking blue hamster named Marion. They have an odd-couple style relationship and search the universe together for Cassie’s father. The blue space ship the pair use is divided into two parts, a driving cockpit which can be detached in order to fly down to a planet in a similar manner to a jolly boat from a vessel and a larger booster component which is attached on top of the small driving compartment. Scenes involving driving often show large objects and rooms that appear within the ship. The name of the ship is Keith. Running gags include Marion pulling many, or odd, objects from his cheeks as if they are large pockets. In one instance he pulls out a large assortment of objects to help him and Cassie when they are falling off a cliff and this includes a cruise ship. Also, one of the science fiction references is the gag in which C-3P0 from Star Wars appears in the ship and Cassie asks who he is. Every episode starts with a brief explanation of the basic running plot and features a sequence showing Cassie’s father being taken away. This is followed by a short sequence showing Marion being uncovered from a ‘tough’ armoured outfit and standing on stilts. The next sequence features the screen divided into four quarters, each showing several different scenes from episodes. The credits culminate in Marion uttering a fierce growl. The closing credits show an image of stars in space. The tune to the theme sounds like the words ‘bounty hamster’ but with notes to a 3-4 beat. Despite airing in a children’s timeslot, the show has quite a broad appeal, containing frequent science fiction references, in-jokes and puns, as well as nods to other movies and TV series. Marion’s name and eyepatch is a parody of John Wayne and the character he played in True Grit.